The lunar landscape of the Reykjanes Peninsula, nicknamed the Steamy Peninsula, could be the setting for the movie Armageddon. 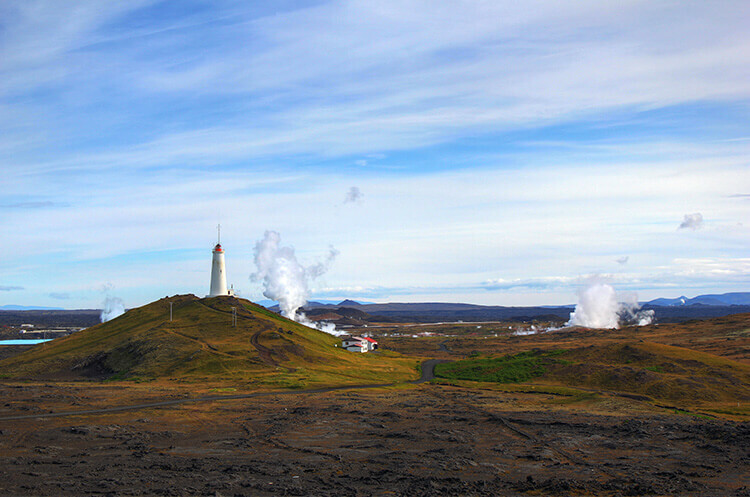 The entire peninsula is a geothermal area and lighthouses outnumber the villages. 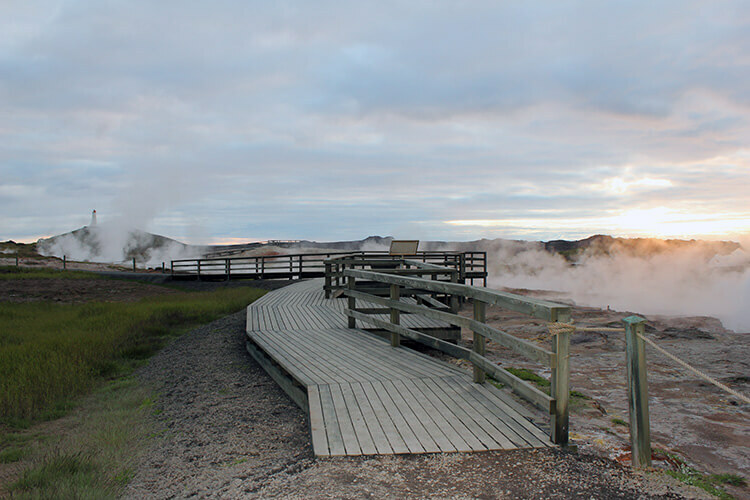 Tourists are often in such a rush to get to Iceland’s famed sights like Gullfoss, Thingvellir National Park and Geysir on the Golden Circle, that they miss a number of really interesting sights all within a stone’s throw from Keflavik International Airport. 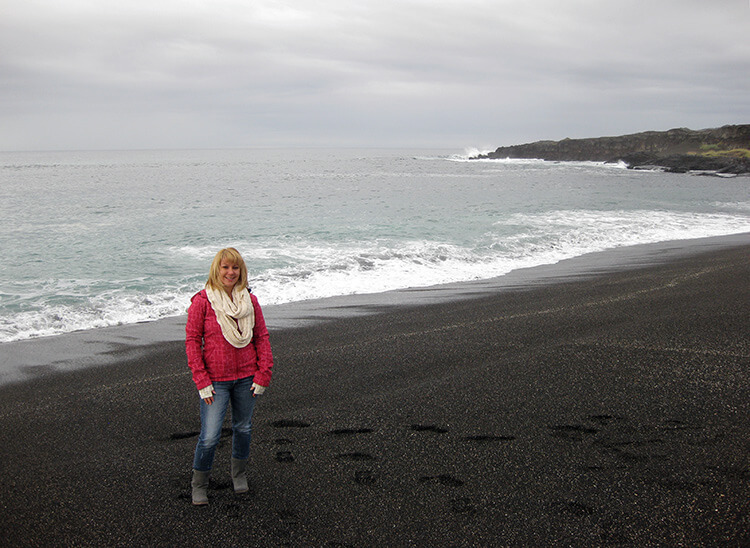 Why not take a day of your Iceland trip to discover the Reykjanes Peninsula? It’s also an excellent location to rent a car and see a bit of Iceland on a long layover. You really have time to see all the sights we recommend and take plenty of photos with about four hours. Best of all? Aside from a car rental to get to these more off-the-beaten-path Icelandic sights, they are all free to visit. First, visit the picturesque Hólmsbergsviti lighthouse, which was built in 1956 and stands 9.3 meters tall overlooking the surf-pounded coast. Designed by Axel Sveinsson, it is one of a set of sextuplets that are located around Iceland. 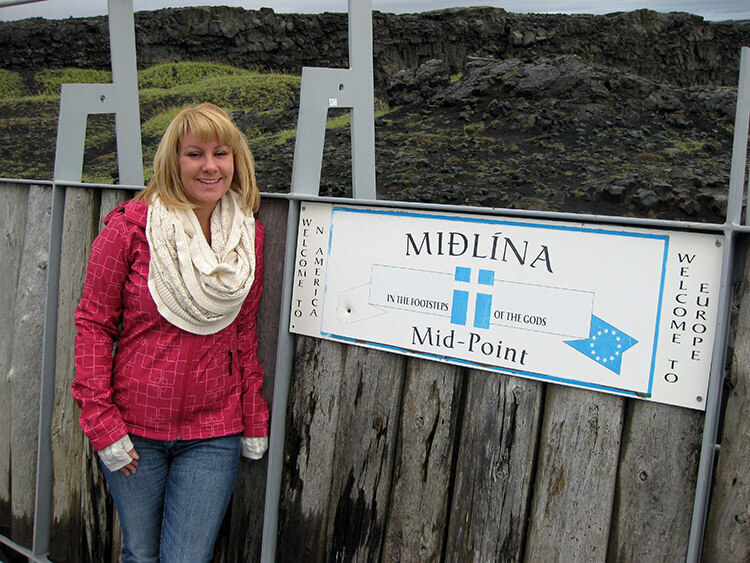 Cross the continental divide at Miðlína, or Lief the Lucky Bridge. It is the bridge that spans the Álfagjá rift valley and was built as a symbol of the connection between North America and Europe. It’s here that you can physically see what your science teacher rambled on about when you learned about the Continental Drift Theory in school. The bridge spans a major fissure in the Eurasian and North American tectonic plates and we can clearly see the diverging plate margin. Even as you stand on the bridge over the fissure, the plates are drifting apart under your feet. But not to worry! They’re moving at a snail’s pace of about 2cm per year. In any case, it’s one of few places in the world where you can physically see the continental divide. You can even stop by the Duus Cultural House on the Keflavik Marina to get a personalized certificate noting your visit. Iceland is no stranger to being the set of many Hollywood blockbusters. Only if you’ve got a 4×4, you can go off-roading on the black sand beach of Sandvík, where scenes in the Clint Eastwood films “Flags of our fathers” and “Letters from Iwo Jima” were filmed in 2007. If you don’t have a 4×4, park and trek down to the beach. 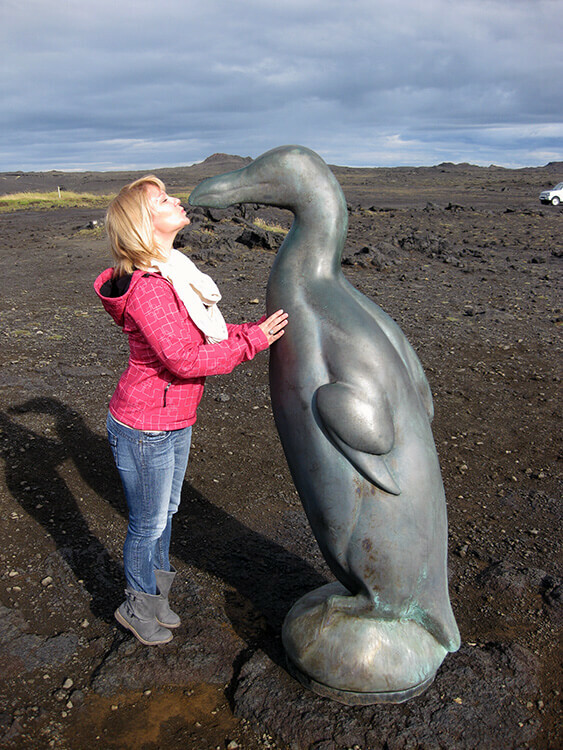 Giving Geirfugl á Reykjanesi a kiss! 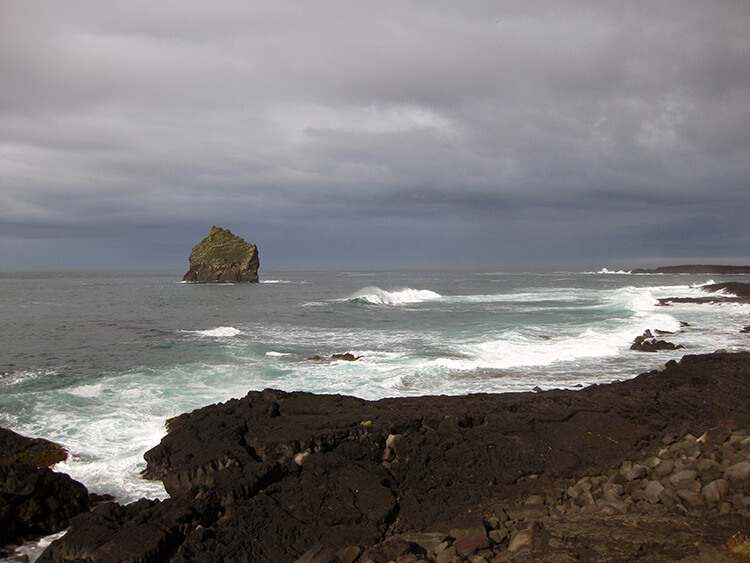 The area below the Reykjanesta cliffs is a basalt lava flow being eroded by North Atlantic waves. A people-sized auk called the Geirfugl á Reykjanesi looks out at Eldey, a tall rock platform rising straight out of the sea. It is easy to climb up the grassy back of the cliffs to be awarded with spectacular views of the sea and surf. Reykjanesviti is the site of Iceland’s oldest lighthouse. The original structure was built in 1878, but just eight years later the building was badly damaged by an earthquake.The continuously beating surf further threatened the lighthouse and Icelanders feared it would just fall in to the sea. A new one was built in 1907-1908 and, finally, in 1929 the current Reykjanesviti lighthouse was illuminated. It stands 26 meters tall, though it stands 69 meters above sea level thanks to its perch on the hill. 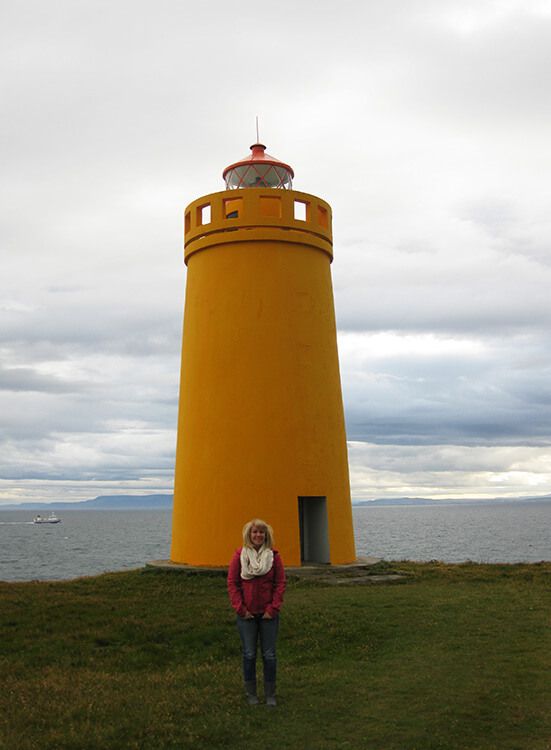 The lighthouse even has a resident keeper and it’s a favorite one among Icelanders. 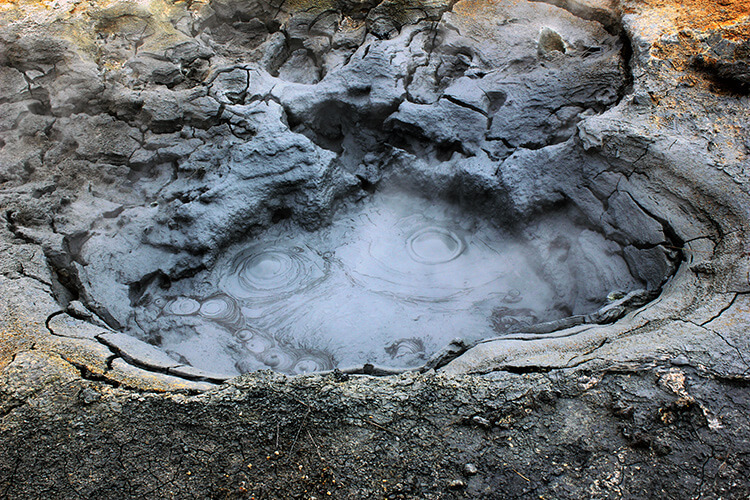 Gunnuhver Hot Springs are the largest mud pot in Iceland. 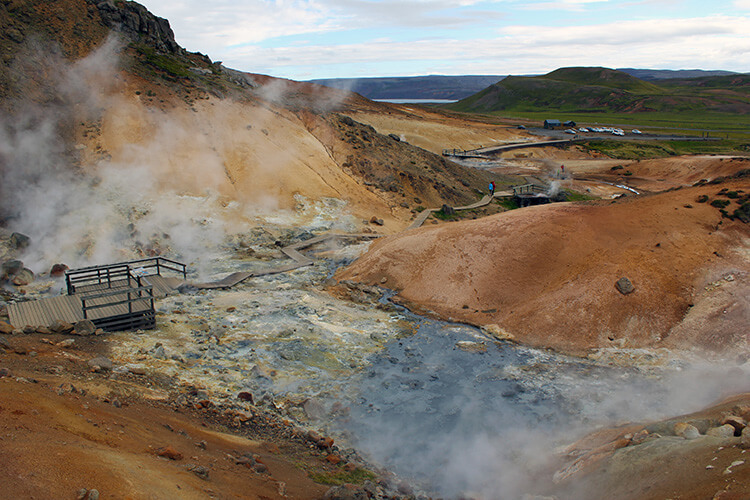 The hot springs are named after a woman called Guðrún, a female ghost who was laid there about 400 years ago. As the tale goes, (which there are many in Iceland!) Guðrún couldn’t pay her rent to her landlord Vilhjálmur Jónsson one day. He evicted her and tossed her out with her only possession: a cooking pot. She became so mad with fury, that she dropped dead. As her coffin was carried to the cemetery, the men that carried her noticed it became lighter and lighter. Repeated whispers of “No need deep to dig, no plans long to lie” stirred in the air. The next night, Vilhjálmur was found with broken bones and blue. Clearly Guðrún had acted our her revenge. She caused great disturbance until a pastor, a known sorcerer, set a trap for her and she fell into the spring with her cooking pot. You can hear the vigorous noises, see the boiling water and mud, and feel the steam on your face. Is it the presence of Guðrún? Icelanders, who are very superstitious, would say so. The Seltún Hot Springs are mud pools and steam vents with temperatures reaching over 300° C. Because of the build up of various gases, including hydrogen sulfide, the mud pools and vents are constantly changing. Some of them have even blown up, like the one known as Drottningarhola (the Queen’s Hole) exploded in 1999. The water underground is so acidic from the build up of sulfur, that plant life just cannot grow here. Once upon a time, the sulfur was even exported for the manufacture of gunpowder. Situated in the middle of a lava field on the Reykjanes Peninsula and created by geothermal seawater, the Blue Lagoon is one of Iceland’s most visited attractions. Driving the road to the Blue Lagoon, you see the overflow of the milky aqua water. The path to the entrance has been carved into the lava rock and the winding shape builds the anticipation for what is to come. 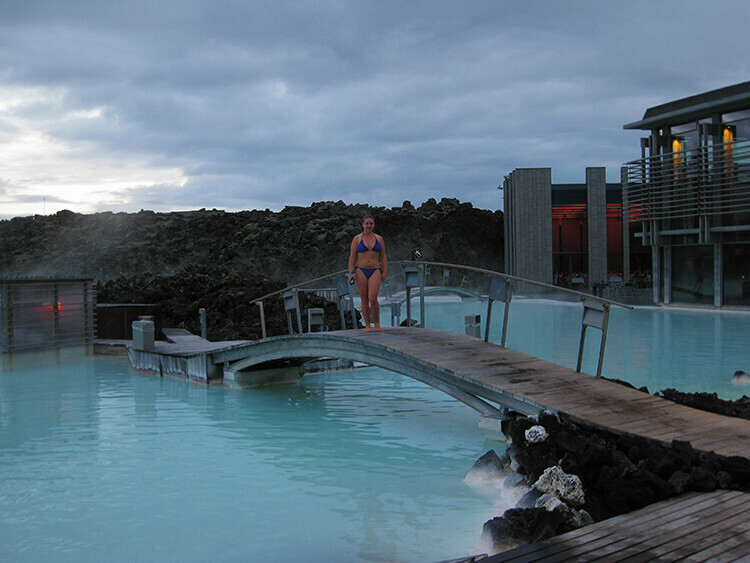 The Blue Lagoon is a pool of geothermal seawater (2/3 saltwater and 1/3 freshwater). The source of the water is as deep as 2000 meters (6000 feet) and is fed by the water output of the nearby geothermal power plant Svartsengi. 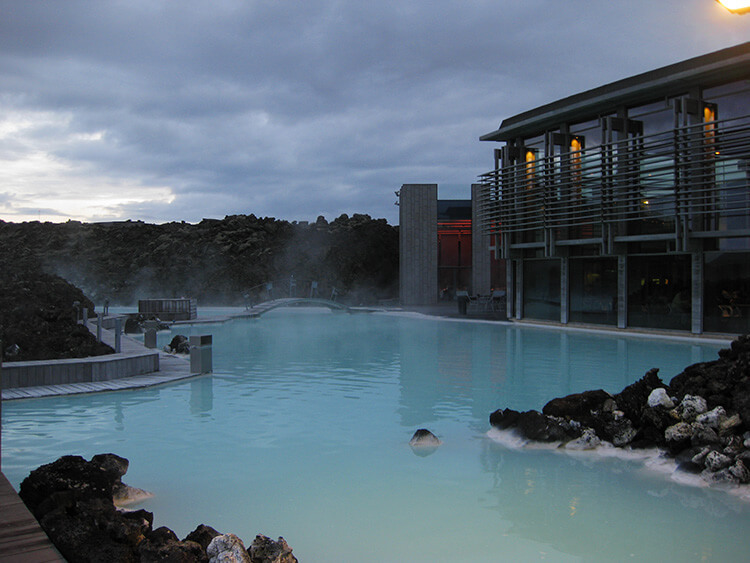 The waters are rich in minerals like silica, sulfur and blue-green algae and bathing in the Blue Lagoon is reputed for its positive effects on the skin. Silica mud is located in wooden boxes in the lagoon. In true Icelandic fashion, apply the mud to your face and body, leaving it to dry. This pure white geothermal mud deep cleanses and exfoliates. A man-made waterfall in the lagoon provides an energizing massage for shoulders and neck. There is also a cozy sauna by the lagoon with a nice view of the Blue Lagoon through the floor-to-ceiling glass. We visited late in the evening and it was easy to find a spot to be alone in the lagoon as we had the lagoon nearly to ourselves. It is quite romantic to watch the sun set over the lava fields while soaking in the warm waters together. 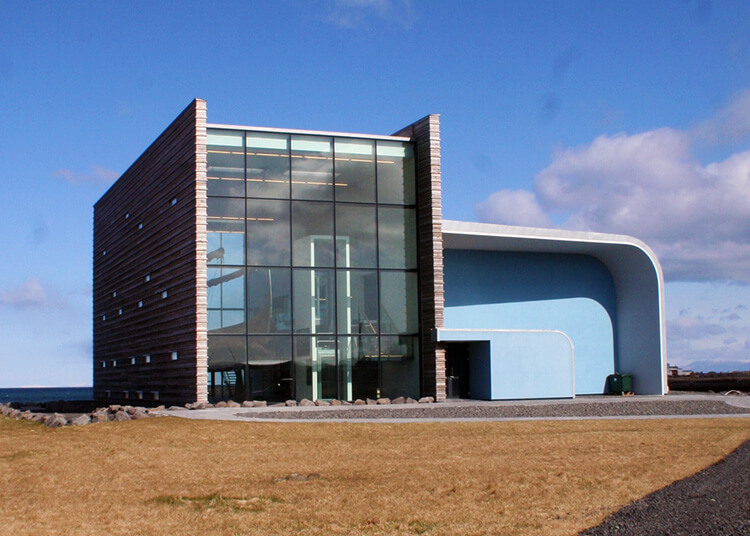 If you’re in to Viking history, then Víkingaheimar Viking World Museum is a must stop on the Reykjanes Peninsula. It houses the Íslendingur Viking ship, an exact replica of the Gokstad ship at the Viking Ship Museum in Oslo, that made its journey from Iceland to North America in 2000. Coming from a family of shipbuilders from the Westman Islands, Gunar Marel Eggertsson claims to be a direct descendant of Leifur Eiríkisson. Captain Eggertsson decided to fulfill his life long dream to sail a Viking ship transatlantic and built the Íslendingur. She measures 22.5 meters in length, 5.3 meters in breadth, has a draw of 1.7 meters and weighs 80 tons. She was built of 18 tons of Norwegian and Swedish oak and required 5000 iron nails. Her sail was made in Denmark. Her average speed is 7 knots, top speed 18 knots. She is equipped with an engine for occasional use but is otherwise an authentic copy, made with ancient techniques, of the Gokstad. Íslendingur is suspended one and a half meters in the air so that visitors can walk underneath her hull and see the workmanship. Aside from the ship, there are other exhibits all connected to the Viking age and the museum can be seen in about 1 hour time. Admission is 1500 ISK for adults and 1300 ISK for students. Children under 14 are free. You can also get 10% off your admission by purchasing your tickets online. Stay at Hotel Berg or Northern Lights Inn in Keflavik for easy access to explore the Reykjanes Peninsula. Several areas of the Reykjanes Peninsula can only be reached in off-road vehicles like a Toyota Land Cruiser. You can rent them for reasonable rates from SADCars. “Letters from Iwo Jima” was filmed in Iceland?? Wow, they really pulled one on us with that didn’t they? Haha, Frank! The beach scene was filmed in Iceland, yes. This is such a beautiful area usually completely overlooked by tourists. I would like to go to Iceland someday — tourist spots, or no! 44 countries and we can say without a beat of hesitation that Iceland is absolutely our favorite country. Hope you get to make it there soon, Abby! Thanks, Stef! We haven’t been to New Zealand yet, but would love to go. The bubbling mud pools are fascinating. We’re just totally fascinated by volcanic activity. Wow!! Your pictures are extraordinary and so many wonderful places to visit and animals to meet! I really need to visit Iceland soon as it’s been on my bucket list far too long! Love, love, love the pic of you kissing Geirfugl á Reykjanesi . Precious!! Thanks, Jeff! Iceland is so stunning that I think it’s hard to take a bad photo there. Of course, the photo credit goes to Tim. He lugs the camera equipment and does such a great job with the photos. Love that color against the gray sky! Iceland is so incredibly picturesque, even when the weather is gloomy! It actually wasn’t cold during this trip. It had been the very beginning of September and despite one or two rain storms, the weather was just about perfect. I’m planning a trip to Iceland this summer and would like to visit some lighthouses. Hólmsbergsviti lighthouse is definitely on my wish list, but I can’t find any address for it and google maps can’t find it either. Could you tell me where on the map it is? Thanks in advance! Hi Anki! You’ll love Iceland! At the bottom of the Reykjanes post, we have a Google map with all of the locations we mentioned in the post marked. It’s the point on the map named Reykjanesbaer. Thanks for all the great information. My wife and I along with another couple are heading to Iceland in early July for three days. What would be the things we have to see and would actually be able to see. Thanks for all your help. In July, you’ll be blessed with really long days and sun out until 11pm or so. That means with 3 days you can get a lot of sightseeing in to a short time frame. After read this blog i will defiantly come to Iceland with my family.